US no longer an enemy? 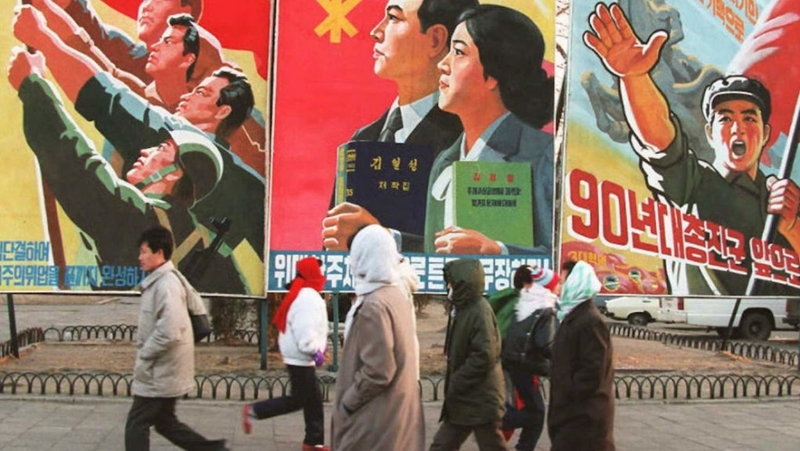 The vast majority of North Koreans have very little access to information, so state media and propaganda have a far greater impact than elsewhere in the world. With the US traditionally depicted as the main enemy, propaganda has not held back on showing how Pyongyang would respond, depicting missiles destroying the US or troops crushing invaders. The posters are meant to inspire patriotism, build confidence in the leadership and a give sense that the struggles of life are for the greater glory of the nation. “The harsh posters go up usually only when things are bad internationally,” Andray Abrahamian of Griffith University told the BBC. So when times are more positive, the propaganda will be too. After months of belligerent war threats, North Korea this year held historic summits with both South Korea and the US, pledging – albeit in vague terms – to give up its cherished nuclear arsenal and work towards peace. The change follows an internal logic: if talks with the South and the US are being reported as the beginning of possible future co-operation then the two former adversaries have to be displayed in a more neutral and less threatening way. Why else would Kim Jong-un otherwise sit down for talks with those countries’ leaders? “Pyongyang needs an atmosphere of peace and detente and such posters would help to create it,” Fyodor Tertitskiy from NK News said. Even the anti-American trinkets which used to be sold to tourists as souvenirs have begun to change. No longer, for instance, can you find the postcards, posters or stamps that famously showed North Korean missiles heading for Washington. “They’re always very popular, not very subtle, and, as of now, have all been removed,” Simon Cockerell, general manager at Koryo Tours, told Reuters. The changes in official policy are also reflected in the leading national newspaper, Rodong Sinmun. There is no free press in North Korea. All media outlets are tightly controlled and anything published or broadcast is carefully vetted to be along official government lines. Usually the paper would regularly run negative reports about the US, depicting Washington as a hostile force and listing US involvement in conflicts like Syria as a proof of American imperialism. But leading up to the meeting on 12 June between Kim Jong-un and Donald Trump, the normally fiery paper stopped being critical of the US. Since the summit, it has featured picture-heavy coverage of the meeting, celebrating Mr Kim as a global statesman and peace maker. Breaking with tradition, TV and newspapers also reported Mr Kim’s recent trips – to China and Singapore – in almost real time, whereas previously, it would have taken days for North Koreans to read about it. “In tone, the US is now depicted as if it is a normal country,” explains Peter Ward, North Korea expert and writer for NK News. There’s even what Mr Ward describes as “neutral” coverage of the US quitting the UN human rights council. With all of North Korea’s talks at very early stages so far, it is unclear whether the sudden change of tone is here to stay. Unless North Korea lives up to the generalised commitments it made at Panmunjom and in Singapore, there will be little sanctions relief in return and so beyond the posters they see every day, little might change for ordinary North Koreans. Straight out of George Orwell, published 1949.